This morning there is so much I want to write about that I am honestly still contemplating whether to write about the Grammys’ red carpet, Oscar de la Renta’s newest interview (I hear he has a lot to say in this one), or Fashion Week. I suppose since we will be drooling over ODLR’s show within the next couple of days we will save his interview for later. So, let’s talk about the Grammys first and then play a little catch up on the weekend’s best collections. Did the celebs comply? Sure they did—kind of. My favorite look of the night was Katy Perry’s mint green, skin tight, Gucci gown. There is no question that Perry looks better than ever… Perhaps we can contribute a bit of that to her relationship with Mr. John Mayer? One thing I do know for sure is that social media exploded last night with nothing but praise for this singing beauty. Rihanna took a tip from the old Rihanna (circa 2005) and sported a gorgeous red Azzedine Alaia dress and her long ombre locks. It’s nice to see Ri Ri a bit more feminine than usual. Speaking of red carpet gowns, Zac Posen showed a few stunning pieces that I’m sure we will see on our favorite starlets next season or maybe if we are lucky, right off the runway and on to the red carpet at the Oscars. I can see the likes of Reese Witherspoon, Jessica Alba, and Rachel McAdams in one of these rust and blush gowns. Meanwhile Chado Ralph Rucci continues the leather and fur coat trends we have seen over the past few days. 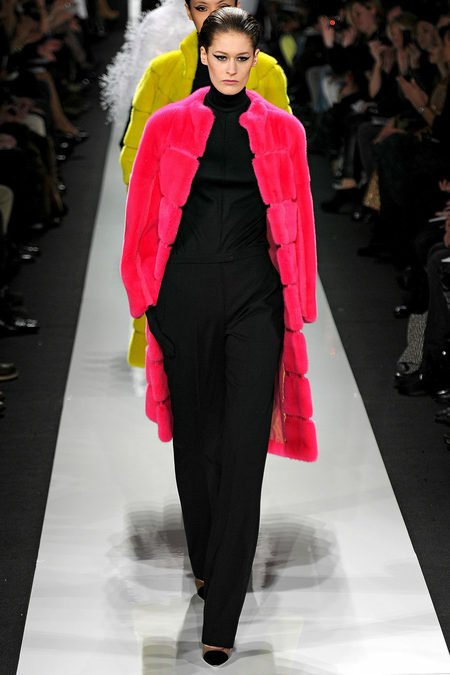 Though, he managed to take his fur to the next level in neon colors of green and pink. Among my favorite looks is this sparkly number… I wonder if tassels will find their way onto the street as everyday accessories?